Discussion in 'Android Devices' started by Fabolous, Aug 8, 2010. Well, it's here, in very basic form. Credit to Elkay at Droid Forums for modding the Milestone overclock module to run on the DX. The file is attached to the bottom of his post, and I will attach it here as well. It is highly recommended to not go over 96 for the voltage parameter! results in attempting to overclock to 1.1GHz on stock voltage (this is stable for me). and proceed to overclock with different parameters. 4n4c0nd4, Phantom_DroidX, paul89 and 6 others like this. Quick question, how do we know if this worked? I'm running a quadrant now to see if I see any gains. lol maybe this is the source of the odd benchmarking results that some people were seeing. There was one or two 1.1GHz test results on there. It confused a couple people into making a thread somewhere around here about it. Glad to see this done. I'll have to try it and post back with my results once I have my phone. Won't complete a quadrant at 1.2/66. 1150000 72 is giving me 1300 and it's stable. Staying there. 1150000 75 is giving me 1308.. trying to get 1175mhz stable though..
Just ran 1.15GHz/72, gave me a 9.82 Linpack and only 1280 quadrant, before the OC I was steady running 1325 to 1365. I wish I could reboot without losing it, just to see if the score would be any better. Edit: A quick question, do we need to run everything over again after a reboot, or just "overclock.sh..."? 1150000 75 is giving me 10+ on Linpack. Thank you for the post. I got 1ghz running with only 36 voltage...I'm gonna see how the battery life is. So that's the highest this cpu can push? 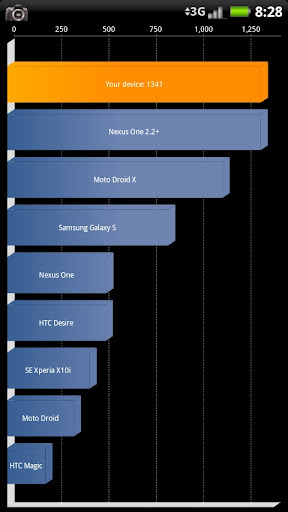 Seems odd that the droid cpu can go just as high if not higher? Here is my setscaling.sh file that'll use low voltages across the board and is stable for me. 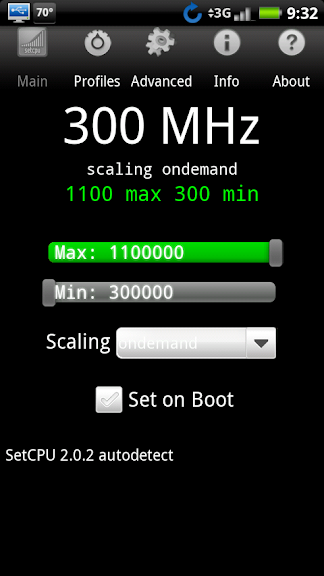 Also uses 1.15ghz @ 34 vsel (stock is 66!) and swaps the 800mhz clock for 900mhz since that is more logical. Drop it in /system/bin, chmod to 755. To load the kernel module do "insmod /system/lib/modules/overclock.ko" first, then execute the below setscaling.sh script. Phantom_DroidX and humungus like this. Here is the script from the previous post. Just unzip and follow the instructions above. Worked as described. Great post! Can we turn this into an autorun script after startup? I'm uncertain what I'm doing wrong. EDIT: Fixed. Instead of unzipping setscaling.sh.zip, I'd just renamed it to setscaling.sh. Worked now. Thanks. Why? They are very close CPU's. Its reasonable they would be around the same speed. Stable for 12 hours now. Waiting to see how battery life is. I got reboots @ 1.15ghz / 30 vsel. So far so good at 34 after 10 hours or so. For some strange reason, my Droid just slows down to a crawl if I set the OC higher than 1.1ghz, regardless of the voltage, though admittedly, the highest I tried was 75 for 1.2GHz. But I modified Hilbe's setscaling script to do 1.1 at 34 and everything has been stable so far (cross my fingers). Got a pretty nice Quadrant bench too, and it survived an Asphalt HD gaming session. We noticed on the other forums, if you set your speed/voltage too high it'll go into a safe mode (turtle speed) of sorts. Basically making the phone so slow it is unusable. I was getting 0.5 linpacks when in turtle mode! I tested my phone in 10mhz increments all the way up to 1.2 ghz, and the highest I could get non-turtle was 1160mhz. However, I did get reboots at 1160mhz though and did not have any reboots at 1150mhz.